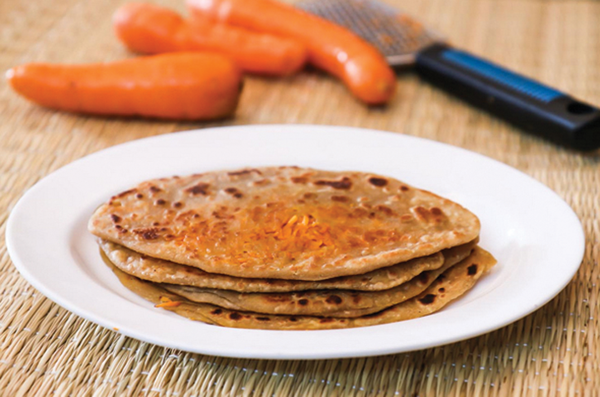 For those looking for an alternative to the more commonly available Aaloo da Parantha (stuffed potato flatbread), look no further than the gajjar (carrot) parantha to make your mouth water! But for a parantha to taste right, it should be hot off the tava and crispy but soft. So here is a reprint of this popular recipe with some additional information and directions. The favorite Punjab comfort food – the parantha (crispy flatbread) – is popping up everywhere as a convenience food too! Taking a tip from American marketing savvy, the plain parantha has come out wrapped around a meat filling like a kebab of shredded chicken as a “wrap”. It’s a variation of a taco, burrito or other wraps, but the wheat bread is certainly tastier than a tortilla. Some mom’s even pack it into lunch boxes as kids in the US much rather prefer munching on the parantha roll than to traditional dal-roti in the school cafeteria. The word parantha comes from parat (turn over) and atta (flour) and it is pronounced in various ways across India and other places where Indians have settled, like Mauritius, Burma, Malaysia, Singapore and Indonesia. Though the basic way to make paranthas is very similar, it’s the stuffing that differentiates them, the cooking method and of course the taste … and even the way you eat them. Gajjar or carrots are good for your vision as they have a lot of Vitamin A. They contain almost no starch but as they have 7 per cent free sugars, carrot juice is not a good option for diabetics as it gets converted to glucose very quickly and can cause a spike in the blood sugar. But grated carrots stuffed in paranthas is a safe way to eat them in moderation. A homemade Punjabi parantha is usually 8 to 10 inches round and nearly ¼ inch thick. It is made of twice-rolled dough, with a little dab of oil and then cooked on each side till there is a crispy, golden brown top layer, which can only happen when you coax the dough to actually puff up and NOT press down hard on it while cooking. Then the crispy side is coated with some butter or oil and served piping hot. 1. Knead the atta into dough with water and set aside for 30 minutes. Make sure that the dough is soft but not thin so that it can be easily rolled out. 2. Peel the carrots, then grate them and place in a bowl. Add the salt, mix thoroughly and let it sit for 30 minutes. 3. Drain the water from the bowl and with your hands, squeeze out the excess from the carrots. The grated carrots will reduce in size and should be quite dry in order to be used as a stuffing. Mix in the rest of the spices and keep aside. 4.Pinch off a piece of dough and make into 1½ inch round padde (balls). Roll each padda out into a 4 inch disc. 5. Spread the dough into the middle of the disc and place two tablespoons of the grated carrots into it. Gather off the ends off the dough with a pinch and then roll into a ball again. 6. Carefully roll out the ball into an 8 to 10 inch disc ¼ inches thick, trying not to spill the mixture in a tear of the dough. 7. Put a small dab of oil on a hot tava (hotplate or skillet) and place the flattened disc on. When it puffs a bit and turn color, turn the pancake over. Turn the heat to medium low. Put another dab of oil on the tava and then turn it over again till it is fully cooked. 8. These paranthas are best served hot with butter or some mango pickle. Shakuntla Malhotra is a skilled cook of Punjabi dishes made in the old-fashioned style that she learnt as a young woman in her ancestral home in Lyallpur, India (since renamed Faisalabad) before it became part of Pakistan after the Partition in 1947. People have often admired her cooking for its simplicity and taste that comes with each mouthful. Even in her early-90s, she continues to cook daily and agreed to share her delectable Punjabi recipes for future generations. People are more health conscious now than they were years ago, especially as diabetes has become a major epidemic among Indians. Consequently, older Indians as a whole have become concerned about their sugar, and are watching their sweet intake though the younger Indians show no caution and continue to put on lots of weight. It’s important to know that excess carbohydrates – like atta (bread), chole (chickpeas), daals (lentils) and other starches like aaloo (potatoes) – and fried foods also contribute to high sugar in the bloodstream. And many vegetables, like gajjar (carrots), shkarkandi (sweet potatoes), chkundar (beets) also contain lots of sugar and should be eaten in moderation. This is often difficult to do when one of the favorite sweets served at major functions is gajjar da halwa (carrot pudding)!